The support of qualified help and all-embracing companionship is offered in order not to leave the sick person alone in front of the fear of suffering and death. A medical doctor visits the patients in the centres of MPI every week. The ones who need special care are referred to selected Hospitals and Clinics: the personnel of MPI accompany the patients to facilitate their access to the medical facilities. 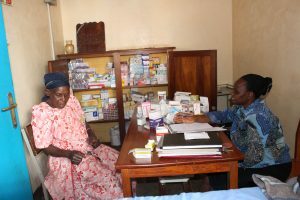 Sick people are also assisted at home; the support is not only medical and material, but aims at rebuilding the patient’s self-esteem and reintegrating him/her as a full member of the family/community. In the early days of Meeting Point International, ARV drugs were expensive, and in short supply. As international donations arose though and scientific advances made ARV medications affordable, MPI clients have begun now to fully experience the wonder of life. Today, MPI supports 2100 patients, 240 of these are on ARV medications. Music and dance, as peculiar expressions of the culture and tradition, are used to enhance the identity of the person and the awareness of belonging to a people. Other activities, such as outings and meetings with significant testimonies, are used to develop the desire for beauty and truth that are aroused in people when they rediscover the value of their own life. For years the women of MPI have been making necklaces. At the beginning it was used as part of hand-craft together with making sweaters but later it has become way to sustain their families. 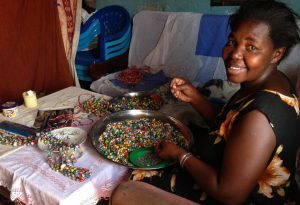 Using recycled glossy magazines the women create beads which are then used to produce intricate necklaces, bracelets and earrings. women no longer need to toil breaking stones in the Kireka quarries and women who had no food can now feed their children. The therapeutic outcome that results from sitting together and making these necklaces together is immeasurable. MPI allows its clients to take out small loans so that they can begin businesses to generate their own income. These small businesses enhance the capacity of families, and most of all make families empowered, with a reinforced sense of responsibility and dignity. With loans of only a few hundred thousand shillings (approximately $150) men and women are able to build vegetable stands, brick businesses and tailoring shops. 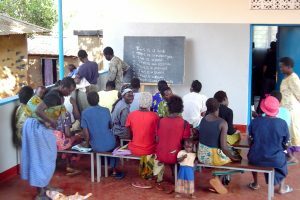 Courses in Health Education and Hygiene are regularly held in the slums with the purpose to educate to the value and dignity of life through the care of the person and the environment. The aim of these courses is to teach skills through which people can learn activities more suitable to a situation of permanent sickness. This also helps to break the solitude and the perception of uselessness. Illiterate people are taught English, reading and writing. This makes them freer, helps them face new situations in daily life and increases their self-esteem.